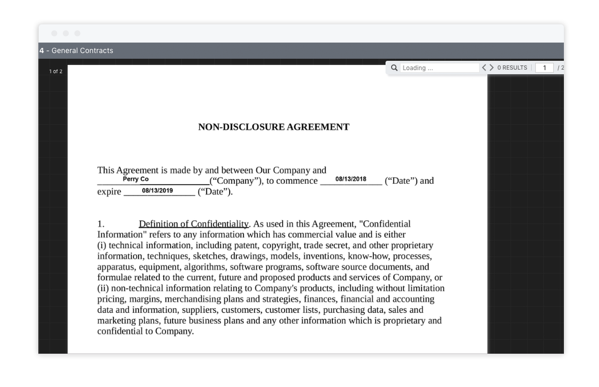 Now’s a great time to start digitally signing in ContractWorks. Our built-in electronic signature feature has been enhanced with powerful new features to help you quickly and easily get your documents signed. Read on to learn more. ContractWorks electronic signature templates allow businesses to upload widely used documents such as non-disclosure agreements and employee contracts into the system, and to quickly send out those documents for signature, again and again. To make these templates even more useful, we’ve added the functionality of creating custom form fields within the contract or document that are trackable as tags. With an employee contract, for example, you may add the informational form field or tag value of “position title,” “salary,” or “start date” to your electronic signature template and mark up exactly where on the document you would like to place those fields. When a new employee joins your company, you can quickly fill out these form fields/tag values, and they will automatically be entered into the document. You can then send out the document for signature with ease. This information will be visible to the signer, but they will not be able to modify or change these values. Another useful way to use these fields/tags are to add custom fields to be filled out by the signer. For example, in that same employee contract, you could have the signer fill out “email address.” The information that the signer inputs into that field will be applied to the document and will appear once the signature packet is finalized, and will automatically be stored and tracked as tags for that document. You will see this option appear as “Tag” when you mark up the document for signature. 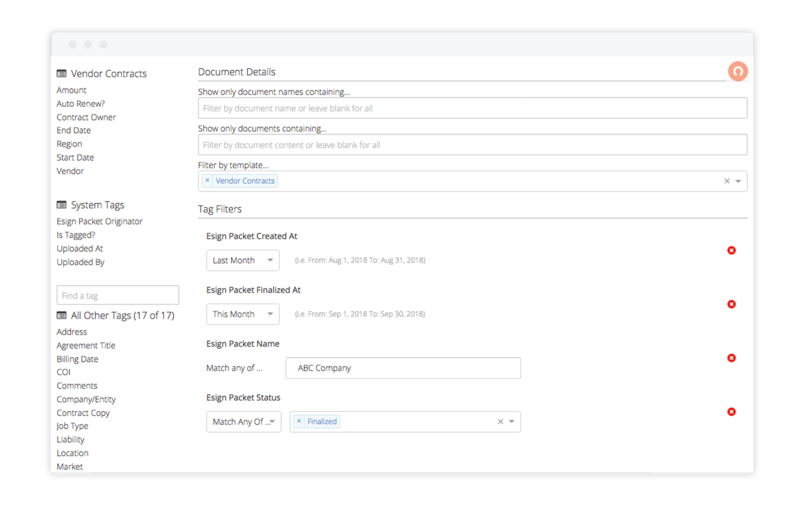 The flexibility and customization offered through adding informational fields/tags is a huge time saver for businesses sending large volumes of agreements out for signature. Best of all, these tags are reportable and trackable just like any other tag within ContractWorks. Reporting on electronic signature documents and their status provides for better overall communication to further save time and maximize productivity for customers deep in the trenches of contract management. That's why we have added electronic signature reporting, available through the reporting feature. Simply select new report and filter by options such as the electronic signature packet name, originator, status, when it was first created, finalized, and more. As always, these reports can be saved, exported, or sent out to individuals on a recurring basis. You will also notice a new option available in the Sign tab that allows you to view reports of aging electronic signature packets quickly. The report includes documents that have been sent out for signature but not finalized within the last 7, 15, and 30 days. An aging report of all electronic signature packets sent out for signature in that last seven days but still incomplete is automatically emailed weekly to the signers and the signature workflow originator. The electronic signature packet page has a whole new look with added enhancements to help you and your team be informed of the status of your electronic signature process quickly and easily. When selecting the Sign tab, you will now see quick stats concerning your e-sign packets including the average time it takes to sign, how many packets are out for signature, how many have not been completed, and which are aging over 7, 15, and 30 days. At the top of the Sign page, you will now notice Signing Reminders. This provides an actionable reminder of what documents are out for signature that are awaiting your signature. Simply click “start signing” to add your signature. To make the process of selecting signers quicker and easier, we have now added the option to manage your existing signers. On the Sign page to the right of the list of packets out for signature, you will see under Tools the option to Manage Existing Signers. This feature allows you to organize a list of your existing signers by enabling or disabling them. This helps you to keep a list of your frequent signers available to you. Here at ContractWorks, we understand having flexibility within the signature process is important for customers. In order to add more flexibility and to help expedite the signature process, we have now added the ability to modify or remove signers within a signature workflow without having to cancel the entire operation. From the Sign tab, just select the name of the packet that you would like to modify, then scroll down to the signer’s details. From here, you can choose the filter option to see the audit trail of the signer and edit the signer. Simply change out the signer’s name and email address and the documents will be re-routed to the new signer. There is no need to cancel or re-start the signature workflow. This is especially helpful when someone is out of office.